Pinkadots Elementary : Fun Thursday! PIN IT TO WIN IT! Blog Award! Fun Thursday! PIN IT TO WIN IT! Blog Award! Today was a great day of vacation. Robyn and I had our kids together for a play date, we ate pancakes for lunch, had a great thunderstorm that cooled down the heatwave, did 5 loads of laundry, finished some TpT products and now it is time to relax! Robyn and I were having fun on Facebook tonight with our Facebook friends, posting flash freebies and playing games...if you aren't a fan yet, you might want to check it out. There is also a super cool fan only freebie on the page! 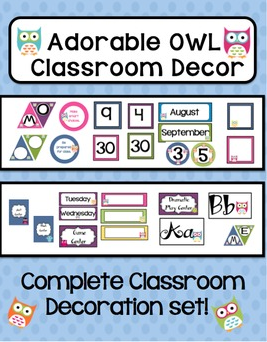 Today we posted some NEW items in our TpT store! 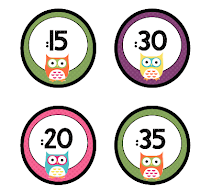 First we updated our Owl Classroom Decor, by adding clock numbers (:00, :05, :10...ect) and an alphabet (2 letters per page). It came out SOOOO cute! 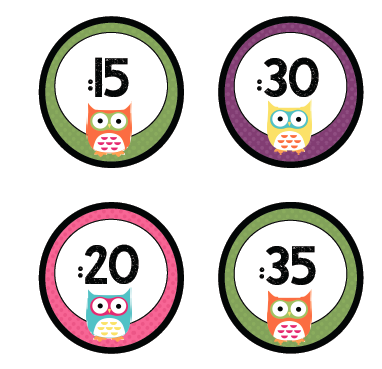 I need to make the clock numbers in zebra print for my room now (Robyn's room is the owl theme). 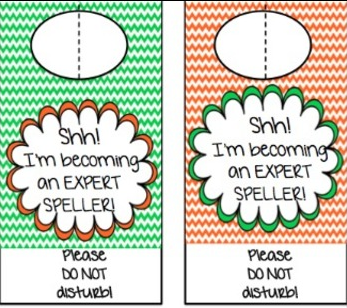 We also redid our door hangers that we handed out last year. 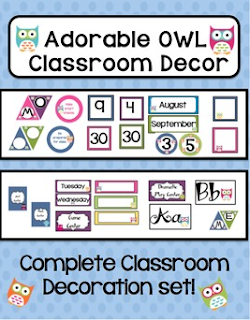 They were such a huge hit with parents and kids that I wanted to give them out at the start of the year! 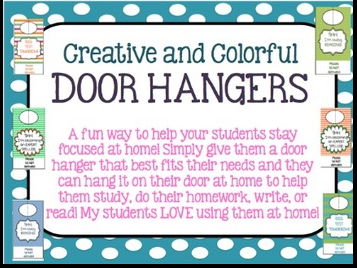 We made more color options and more phrases for the hangers. 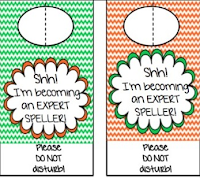 I cannot wait to print, laminate, and surprise my new students with them! 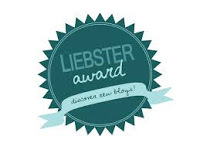 When I went into my email today I had the sweetest note from Jess over at Literacy Spark saying that she nominated Robyn and I for the Liebster Blogger Award! How cool is that!!?? It's our first award and we couldn't be more excited about it! I was a huge blog stalker and loved finding ideas on the internet. I always wanted to start my own blog, but never found the time. When I was home for winter break last year, I bit the bullet and started. I absolutely love it and enjoy learning HTML code and graphic design on my own. I love the friendships I've made with the other bloggers and the fun that I have getting to know them! 2. Name one talent you have. Cooking? I love to cook, but hate to clean! Writing. I love creative writing and I absolutely love turning children afraid of writing into student authors. 4. If you could go on vacation to anywhere in the world, where would you choose? 5. Name one book that has inspired you. The Book Whisperer - We were lucky enough to have Donalyn in our school last Fall for a PD. Not only was she uplifting and AMAZING, but ridiculously inspiring. 7. Do you use a Mac or a PC? 8. What is your most favorite place to shop for clothes? 9. What is one thing you need to learn to become a better blogger? How to plan out my posts DAILY and be consistent. 10. If you weren't a teacher, what career path might you have chosen? I'd love to be a nurse or a graphic designer. Some days when I am having a tough teacher day...I often want to work in a cubical, alone, in front of a computer...lol I know I wouldn't be happy there though. 11. What chore do you hate doing the most? I absolutely HATE putting laundry away. I wouldn't mind folding it so much if I knew I had a place to put it. My husband has two dressers and they both overflow! His clothes are GIANT so he needs a dresser made for a giant! GRRR. 1. I played the clarinet for 8 years. I even taught lessons to kids when I was in HS. 3. I was born in Connecticut and have lived in CT my whole life. 4. I LOVE eating fresh food from our garden. 6. I have 0 pets and am not looking to get any soon. Two kids are enough to keep me busy! 8. I started dated my husband on 6/21, we closed on our house on 6/21, we got married on 6/21 and both of our kids were born on 12/6...all different years. CRAZY, huh!? Apparently I should play 6, 1, 2 for lucky numbers. 9. My husband is a hunter and I love it. We eat venison all year. 10. I am a kid at heart. 11. I hate house work...but do it because I hate a messy house. 5. Name one book that has inspired you and explain why. Congratulations on the award nominations! I know you are both super proud. Keep up the great work! Thanks so much!! It means a lot that you considered me for the award;) I have been following your blog for some time now and it is amazing! !